The more I think about economic policy the more I think that there isn’t a big enough dose of interpretivism applied to it. This thought recurred yesterday reading George Osborne’s set piece speech in which he, as Isabel Hardman of the Spectator put it, “trashed” Plan B. I think trash-talk would perhaps be a better description of his approach. One thing that – some – economists have learnt from the Great Recession of 2007-08 is that our understanding of the economy is rather more partial than had hitherto been assumed. That doesn’t mean that economists don’t have interesting and useful things to say. But the economy can behave in ways that economists found difficult to read. Some would say this means models need to be refined, respecified, recalibrated. Other would take a more radical stance and say that the economy and economics needs to be rethought. Conventional models and methods don’t have room for some of the characteristics that are fundamental to the way the economy functions. Chris Dillow highlighted some key points last week in the context of a post about the difficulties of forecasting. If you were thinking about it in terms of narratives you might suggest that what is needed is a change of root metaphor. Much economic writing still treats the economy as a machine that obeys the laws of Newtonian physics. Hence we talk about calibrating relationships that are linear or linearized. We talk about removing frictions. We talk about linkages and transmission mechanisms. We talk of velocities of circulation. Well, some do. If we instead rooted our thinking in a biological metaphor then we would think more in terms of time, development and change, expectations, knowledge and learning. There would be space for market sentiment; for births and deaths; for evolution. That is hardly a new point. Some might say that the root metaphor is what distinguishes the real economics of the academy from the ersatz economics of the business commentariat. That may largely be true. But the presumption is that this casts the academic approach in the more favourable light. And that may not be the case. The uncertainties in economic knowledge open up possibilities for competing readings of events. And that in large part was Osborne’s theme yesterday. The fluidity of the situation opens up a discursive space. He sought to impose his preferred reading on unfolding events while, at the same time, launching a pre-emptive strike to undermine the alternative reading of the situation offered by his critics: or, rather, to undermine his interpretation of their reading. I am not going to offer an in-depth deconstruction of his speech. I’m not sure I’ve got the energy. But I wanted to make a few points. The first point is that Osborne gives an assured presentation of his reading of the situation. Yet just about every claim he makes is highly contestable. When he comments on what has happened to the economy, what is happening to the economy, what effect Plan A has had, what effect Plan B would have, and the adequacy of the policy responses around regulation and microeconomic reform he is seeking to stabilize a particular reading of the situation, underpinned by a range of debateable causal claims. These are truth claims that perhaps make sense from within a particular worldview. But it would be perfectly possible to wheel out counter-claims that, for example, the action the Government has taken on banking reform, or macroprudential regulation, or to deal with levels of private debt are wholly inadequate. Or that headline claims about jobs generated, reducing levels of economic inactivity, or the impact of tuition fees on university finances are being given a misleading spin. The second point is that, for me, the speech doesn’t really frame the issue in the right way. Were critics of plan A saying that the economy would never recover if plan A were followed? I don’t think so. At least not if they were sensible. They were saying that plan A inflicted unnecessary pain and prolonged the pain for longer than was necessary, while at the same time doing longer-term damage to the productive capacity of the economy. That argument is not invalidated by signs that the economy is picking up. And given that much of the recent growth in GDP is attributable to exports it is as much about what is happening in the rest of the world as it is anything that can be attributed to government action. you don’t solve the pressure on cost of living with simply a shopping list of interventions and government regulation. Of course, there are important improvements we can make to the scale of energy and water bills, the cost of housing, the fees paid for everyday financial services, the expense of rail and road travel. These are a burden on families – and we are doing everything we can do to reduce their cost – with more to come this autumn. We know every penny counts for hardworking people. But by themselves these changes don’t amount to an economic policy. And to focus exclusively on these things alone, important as they are, is to miss the wood for the trees. I know that times are tough and that family budgets are squeezed. But fundamentally, Britain is poorer than it was not because government didn’t intervene enough, or rail regulation wasn’t tough enough, or rental policies weren’t fair enough. He glides on from here without offering any great insight into the “important improvements” concerned. And of course “can make” is rather ambiguous. It doesn’t mean we are going to make them. In most of the policy areas listed here the “doing everything we can do” has not so far amounted to very much. It is either disingenuous – because there is more that could be done but we choose not to do it – or an admission that government is powerless to address oligopolistic utilities markets, the problems of speculators cornering commodities markets, and the like. Finally, the points about narrative and interpretation come out very clearly in Osborne’s references to housing. He makes much of the venue for the speech – 1 Commercial Street. He explains that as a development this stalled with the crash of 2008 but it is now moving ahead again towards completion. 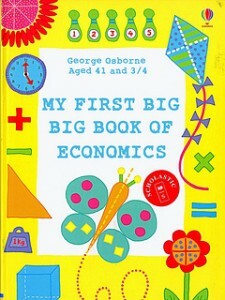 Osborne reads this as a wholly positive sign that the economy is turning the corner. Yet you can read the housing market, and specifically the development at 1 Commercial Street, rather differently. But I don’t need to discuss that in detail because Jules Birch has already done it beautifully. Go read it here.